Interbay Supportive Housing, a 4-story residential building, developed and run by DESC, is located in the 15th Ave. corridor in the Interbay neighborhood. This project has created 97 units of affordable housing with supportive services for homeless men and women living with serious mental/addictive illnesses or other disabling conditions. The ground floor includes offices for the on-site staff and resident common space, as well as a kitchen, dining/community room, television lounge and a small computer lab. Fazio Associates collaborated with the client and design team to incorporate courtyards and raingardens into the landscape program. 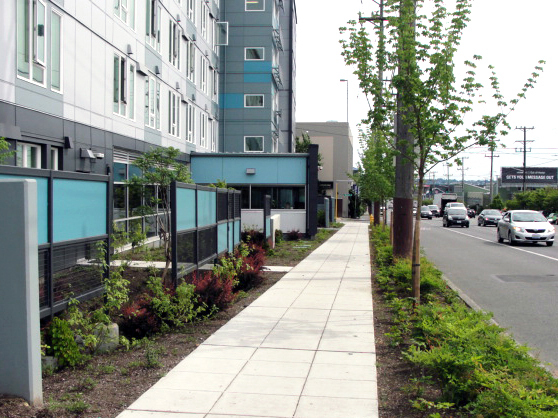 The use of raingardens and screens along 15th Ave. is to provide a sense of privacy and security to the residents. The resident courtyard landscape design, and landscape buffers surrounding the building are designed to buffer sound, retain soil, provide privacy from neighboring properties, and provide attractive, private outdoor space for residents and staff. P-patch planters at the upper terrace offer an area for tenants to plant their own gardens.